**DRIVE AWAY FOR JUST £50 A MONTH- NO FEES! 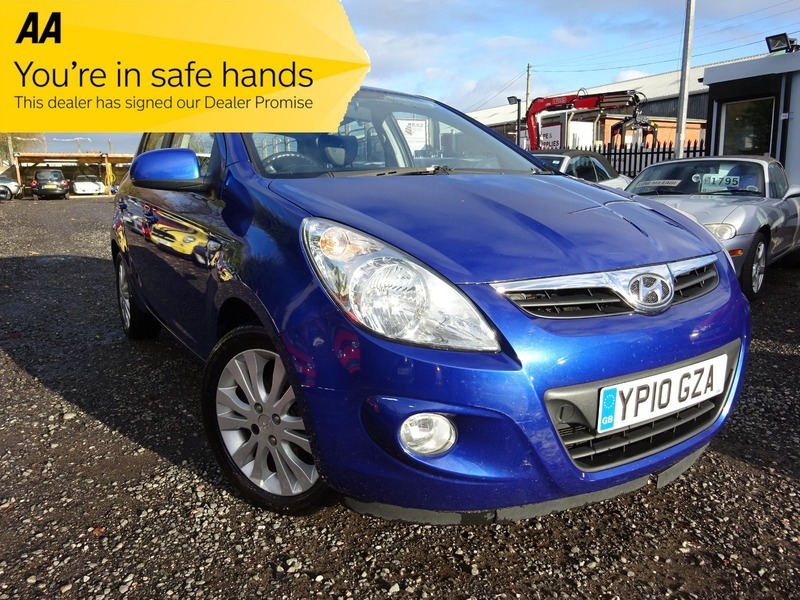 * Here we have a lovely i20 in excellent condition inside & out! The car drives superb and is the fully loaded Style model with leather, Air con, Alloys & more! Only one owner from new with full history to show how well they've looked after it! Viewing highly recommended & encouraged!, 3 months warranty, Next MOT due 06/05/2019, Full service history, Leather trim, Air conditioning, Digital climate control, Remote central locking, Power assisted steering, ABS with EBD, Traction control, 3x3 point rear seat belts, Factory fitted alarm/immobiliser, Front & rear electric windows, Electric heated door mirrors, Power folding mirrors, Premium RDS CD Stereo with fingertip controls, Leather trimmed multifunction steering wheel, Front & rear headrests, Height adjustable drivers seat, Adjustable steering column, Multiple cup holders & storage pockets, Folding rear seats, Tinted windows, Front fog lights, 16" Alloy wheels with excellent tyres, High level rear brakelight. 5 seats, Metallic Blue, We are happy to discuss/arrange finance at a competitive rate, with most circumstances considered. Generous part exchange allowances given, all major credit & debit cards accepted! A small deposit will secure this, or any other vehicle, we are open 7-days a week!, Any questions or enquiries please call or email, we'll be delighted to help!, 1 owner, ALWAYS A FRIENDLY & PROFESSIONAL SERVICE! ESTABLISHED SINCE 1980! COMPETITIVE FINANCE WITH NO FEES~WE TAILOR FINANCE QUOTES AROUND INDIVIDUAL CIRCUMSTANCES AND OFFER THE BEST RATES AVAILABLE WITH NO/LOW DEPOSIT OPTIONS!